Over the next couple of years I will be establishing a new apiary in a region that is currently heavily overgrown with rhododendron. In moderation rhododendron are attractive evergreen ornamental shrubs that flower profusely for a short period in spring. However, in many areas where rhododendron has been introduced, they have become highly invasive shrubs that have spread widely through seed dispersal and suckering. As a beekeeper there are some interesting links between rhododendron, bees and honey. The common rhododendron (Rhododendron ponticum) is native to Southern Europe and South West Asia. Although it was probably present in Great Britain before the last Ice Age it only became re-established after the late 18th Century when reintroduced by nurseries for ornamental gardens. On the west coast, particularly in Snowdonia and western Scotland 1, rhododendron has become highly invasive, covering large areas of land and even entire hillsides. It swamps native trees and the development of understory growth by cutting out any light getting to the ground. In addition it poisons the soil to prevent competition from other plants. 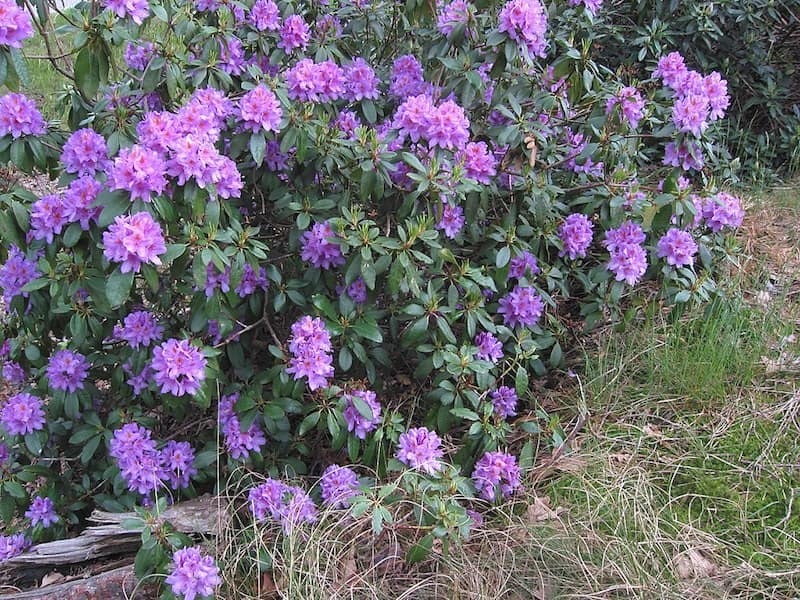 Rhododendron is considered a major problem and grants are available for its removal. Estimated costs for eradication of rhododendron from Snowdonia and Argyll and Bute are £11M and £9.6M respectively 2. It looks striking when it’s in flower … but for most of the year it just looks green. Rhododendron are insect pollinated and produce large amounts of sugar-rich nectar to ‘reward’ visiting pollinators. A number of species of bees are known to pollinate rhododendron, including honey bees. Surprisingly – for an insect pollinated plant – rhododendron nectar contains high levels of diterpines which are toxic to many different animals. These types of toxins are usually produced by plants to reduce foliar grazing. The most important (by amount) diterpine in rhododendron nectar is grayanotoxin. Grayanotoxin is a neurotoxin. It works, i.e. its toxicity is due to, interference with voltage-gated sodium channels (VGSC) in neurones. We’ve discussed VGSC’s before in the context of resistance of Varroa to Apistan. Symptoms of grayanotoxin poisoning include cardiovascular problems, nausea, vomiting and loss of consciousness. But wait, there’s more. Add to that heady mix one or more of the following … blurred vision, dizziness, hypersalivation, perspiration, weakness and paresthesia4 in the extremities and around the mouth. In higher doses, symptoms can include loss of coordination and severe, progressive, muscular weakness. Fatalities are rare but not unknown. These are all symptoms in humans experiencing grayanotoxin poisoning. Great … could it possibly get worse? Recent studies have suggested that grayanotoxins are also toxic for some bees. In these laboratory studies, honey bees fed syrup laced with field-realistic doses of grayanotoxin were twenty-times more likely to die than those fed undoctored syrup 5. Note that this does not necessarily mean that honey bees foraging in the natural environment are twenty-times more likely to die. The laboratory experiments effectively ‘force-fed’ bees syrup containing the toxin. Toxicity was monitored 6 hours post feeding. Perhaps they were hungry and, having no choice, ate the stuff 6 and consequently poisoned themselves. In the natural environment there are probably a wide range of nectars available simultaneously. Perhaps the bees simply change their diet and choose these nectars instead? I don’t think that this has been formally tested. At least, not yet. It might be an interesting experiment to conduct. You could set up a feeding station with syrup, train the bees to use this sugar-rich source and then add grayanotoxins to the syrup. If the bees continue to gorge themselves on the toxin-laced syrup (and showed increased mortality) then they presumably either can’t taste the grayanotoxin or can, but don’t care 7. Alternatively, they might switch away from the toxin-laced syrup and use other plant and tree nectars and, in doing so, not jeopardise their longevity. Although this experiment hasn’t been conducted, we do have evidence that honey bees forage on nectar from rhododendron. If bees forage on rhododendron the grayanotoxin-containing nectar would get processed in the hive to create toxin-laced honey 8. Since grayanotoxins are known to be toxic for humans this honey would be expected to exert some adverse, or at least interesting, effects. And that’s exactly what is seen. The most common cause of grayanotoxin poisoning in humans is from eating honey made by bees foraging on rhododendron. Small doses cause light-headedness and hallucinations. In large doses it is overtly toxic and induces the range of symptoms described above. In Nepal and parts of Turkey this so-called ‘mad honey’ is deliberately produced. You can buy mad honey online … a snip at $199 for 250g 9. As well as causing light headedness and hallucinations, mad honey is consumed – particularly in Turkey – because of its perceived therapeutic benefits for conditions such as diabetes, bowel disorders and hypertension. Perceived because I’m not sure there’s real evidence of benefits for any of these conditions. Are Welsh or Scottish bees foraging in rhododendron-infested areas able to produce ‘mad honey’? I don’t know. I guess I’ll find out. After all … there’s a lot of rhododendron. There are a few disputed reports of honey toxicity case studies in the British Medical Journal. Some are very old and are suggested to actually be caused by fructose intolerance. There is also a reported Scottish case where a man licked rhododendron nectar from his hands and rapidly experienced paraesthesiae (‘pins and needles’), loss of coordination and an inability to stand, symptoms which resolved completely a few hours later 11. However, I strongly suspect that a range of factors mean that although a beekeeper might be mad to try and produce honey in these areas, he or she would be unable to produce mad honey. 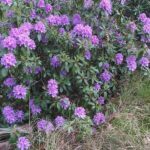 Rhododendron blooms relatively early in the season, the climate of the UK and Nepal/Turkey are dramatically different and there are known to be significant strain-specific variations in grayanotoxin production between rhododendron. On the island of Colonsay – the first black bee reserve – there are extensive tracts of invasive rhododendron and yet Andrew Abrahams, the local beekeeper, produces excellent heather honey there. 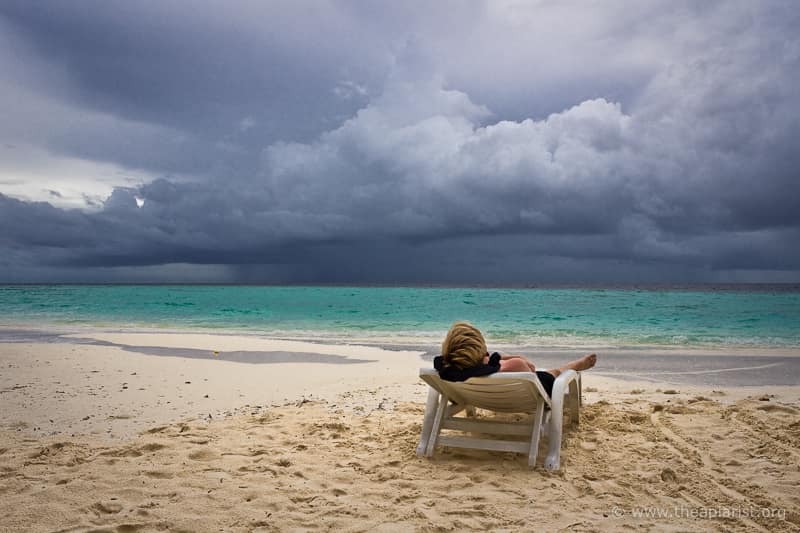 And in New Zealand, which has a similar warm and wet temperate climate. These are 2008 figures so will be considerably higher now. A very imprecise and wholly unscientific catch-all term. A burning or prickling sensation … one of the characteristic feelings (apparently) when ‘mad honey’ is placed on the tongue. The justification of this experiment was to determine whether invasive plants producing toxic substances might be responsible for the reduction in pollinator numbers. It’s worth also noting that survival of Bombus and Andrena species tested was not affected. Different stuff this time, don’t get confused. There are other outcomes … they might eat the syrup but not show any increased mortality. Perhaps other things in the natural environment counteract grayanotoxin toxicity in honey bees? There are also ways in which scientists can test what bees can or cannot taste. This simple statement makes a host of assumptions on the half-life of grayanotoxins, the inability of enzymes in the honey stomach of bees to inactivate the toxin etc. Bear with me. This is not an endorsement! Eroğlu SE, Urgan O, Onur OE, Denizbaşı A, Akoğlu H (2013). Grayanotoxin (mad honey) – ongoing consumption after poisoning. Balkan Medical Journal. 30: 293–5. Cooper MR, Johnson AW. Poisonous plants & fungi: an illustrated guide. HMSO, 1991. This entry was posted in Beekeeping, Honey and tagged grayanotoxin, Nepal, Turkey on September 28, 2018 by David. I think you’ll find the honey bees forage elsewhere David. I’ve never seen them on the ponticum, nor found their honey makes me any madder than usual! Would be very interested to hear about the experiment if you try the test you mention, adding grayanotoxins to syrup feed the bees are already feeding on. Good to know. No mad honey here then. Unfortunately, it’s not the sort of experiment I do … Mark Brown might be encouraged as he did some of the toxicity studies on grayanotoxins. What’s also good to know is that I can respond to this comment from the peninsula where we’ve just had 20Mb broadband installed. I saw our sheep perish in snowy season, poisoned by eating Rhododendron leaves. I tried to destroy the bushes but they quickly recover. It was always a worry for my own bees. My daughter is in Nepal for a year, recently bought honey there. I shall pass it on. Thanks. I think it’s a never-ending battle but am hoping that a combination of chainsaws, brushcutters, machetes, massively toxic chemicals, brute force and a limitless supply of ignorance will get a result. Unfortunately the deer don’t eat the rhodos. If they did it would either reduce the numbers of rhododendron, or the number of deer, or both … either would be welcome. Excellent article. Thanks for the info. In our part of the world, (western Washington, US) we have a lot of Rhododendron (popularly cultivated and otherwise). There is a great deal of confusion in general about how the nectar effects honey and honey bees and it’s nice to have my limited understanding of these issues clarified and confirmed. Here, the plants bloom around mid-May into June and it’s extremely rare (if ever) to see Apis mellifera on these flowers. (possibly because they have so many other choices…?) but very common to see various Bombus working them. I just always assumed mellifera had no evolutionary relationship with Rhododendron as it has with, say Apis laboriosa which actually does have such a relationship. Of course mellifera being “non-native” here, there are many plants they don’t pollinate, so I’ve never given it a second thought. Next year I’ll have to pay closer attention, but for the most part, our bees won’t touch them. I agree the “experiment” would be interesting. As noted above, the experiment would be interesting but I’m not really the type of scientist who does that sort of experiment … I’m more of a gene jockey, doing molecular biology in the comfort of an air-conditioned lab. We’ve a few bushes flowering already here but it’s too cold for bees to be out foraging anyway. Kate Atchley (above) knows the area well and I’m pleased to see she thinks the bees forage elsewhere. As you are in a good position to watch perhaps you will get to see which bees visit your local rhododendrons! Thanks for that Emily … I’d missed your article. Very interesting. Definitely interested to read your results. We are in Tasmania and have 2 Rhododendrons on our property which I have seen bees at but I’m not positive they are our bees! Fingers crossed we survive to read your Spring results! I’m reasonably reassured from the other comments that there’s nothing to worry about. Some plants are already starting to flower and we’ve got months of very wet weather before the bees start flying again … perhaps they’ll never get to forage on them after all.